We’d love your help. Let us know what’s wrong with this preview of Fingerprints of God by Barbara Bradley Hagerty. From the award-winning NPR religion correspondent comes a fascinating investigation of how science is seeking to answer the question that has puzzled humanity for generations: Can science explain God? Is spiritual experience real or a delusion? Are there realities that we can experience but not easily measure? Does your consciousness depend entirely on your brain, or does From the award-winning NPR religion correspondent comes a fascinating investigation of how science is seeking to answer the question that has puzzled humanity for generations: Can science explain God? To ask other readers questions about Fingerprints of God, please sign up. Well, Barbara Bradley Hagerty set out to find the evidence of God, and the Transcendent reality she hoped to find and -- guess what? She found it! She asserts she's a "journalist" and "reporter," but her awards as a "religion correspondent" tell me more that what she is is a believer looking for any evidence -- or lacking that, any justification to lower the bar for what counts as evidence -- for grounding her belief. She often asserts her feeling that "There has to be more" than this, and her fi Well, Barbara Bradley Hagerty set out to find the evidence of God, and the Transcendent reality she hoped to find and -- guess what? She found it! She asserts she's a "journalist" and "reporter," but her awards as a "religion correspondent" tell me more that what she is is a believer looking for any evidence -- or lacking that, any justification to lower the bar for what counts as evidence -- for grounding her belief. She often asserts her feeling that "There has to be more" than this, and her final crowning realization is: "Earth is not our home." The problem with most religionists is right there, in that five-word negation! They look at what they see and, not happy with it because it changes, seek something that is eternal. The imagined reality is, for them, more real and more valuable than 'just this.' There is no lack of awe in the fact that sub-atomic particles, come together to form molecules that assemble to form bacteria, monkeys, you and me! She leans heavily on WIlliam James and his defense of faith and non-evidential belief basically because it makes her feel good! The ethics of such a 'will to believe' leaves much to be desired, and yet, credulous folk still seek solcace in such pie-in-the-sky wishful thinking! An interesting read, but ultimately disappointing. This would be a good introduction into the interaction of science and spirituality for a non-scientist. As a scientist who has read some on this topic, I found it a little shallow, not in terms of research (obviously extensive and with an honest attempt at balance), but in thinking. In the end, it didn't really tell me anything I didn't know already. When I was only about a quarter of the way into the book, I sat down with two fellow writers to talk shop, and mentioned what I was reading. I surprised myself by admitting to these two ladies — whom I like and respect, but whom I don’t know very well — that I had cried my way through roughly half of what I’d already read of Hagerty’s book. In those pages, I found a kinship with Hagerty — a professional reporter on the religion beat — in her deep interest in other people’s spirituality and her personal conflict over possibly allowing her own beliefs to color her work. Hagerty’s willingness to include her own thoughts and experiences in “Fingerprints,” alongside the findings of and her conversations with a plethora of researchers honestly moved me. While raving about “Fingerprints” on Facebook, I wrote to another writer friend that I’d wished I’d been the one to write this book. I’ve been on a bit of an internal hike of late, reawakening interests that have been ignored or on the back-burner for a few years now. Noetic sciences. Quantum physics. Metaphysical sciences. You know — the stuff that makes my heart sing and my mind reach, but makes other people look at me funny. I’ve always been spiritually inclined, and it’s been both a blessing and a challenge these past two years to be in a relationship with a self-proclaimed atheist. (That dynamic will have to be left for another discussion.) I’ll admit that I’m sometimes intimidated by Mike’s rapid-fire questions about my beliefs, with no room between queries for me to attempt much of an answer. For a good while, I stopped engaging him on religious topics, shying away from the subjects that matter to me most. But now, Mike’s questions and Hagerty’s book have me taking a harder, more intimate and more critical look at what I believe, and I’m asking myself, “Why?” Why do I believe what I do? What are the experiences I’ve had — now somewhat hazy in memory, or lost in the shadows — that have led me to where I am? Hagerty’s approach of speaking with believers and non-believers alike — inside and outside the scientific community — has me wanting to put my own spirituality under the microscope, not so much to be able to answer Mike’s skeptical questions, but to have a better understanding of my own center and perspective. Hagerty’s conclusion — not surprising, giving the title of the book — is that the “fingerprints of God” are all around us, even within us in our very makeup. I don’t disagree, but I think it’s time I launched my own investigation. I’m a “go see for yourself” kind of gal — which has drawn me over the years to sweat lodges, Reiki attunements, psychic surgery, shamanic soul retrieval, crystal and singing bowl healing ceremonies, interfaith seminary, wiccan rituals, transcendental meditation, burning bowls, metaphysics university and hypnotherapy training, in addition to cathedrals, temples, synagogues, mosques and more. But I’ve also been a math and science geek, and even began university as an engineering student. The scientific study of spirituality definitely appeals to me. 2+ stars. Nice effort. Author visits & interviews interesting people, who often seem as nutty as they are intelligent. Possibly a good read if you are interested in working of the brain (layman's level), or science/biology vs religious musings. Not a bad read, but at the end I knew about as much on the subject as when I began (I've read a handful of similar books). On the plus side, FINGERPRINTS OF God helped me get to sleep. For a similar book with a bit more humor: Spook: Science Tackles th 2+ stars. Nice effort. Author visits & interviews interesting people, who often seem as nutty as they are intelligent. When I first heard of Fingerprints of God I was filled with anticipation that this might be the book I've been looking for on the search for physical evidence of spirituality in the world. But, wow, was I disappointed!! Written by a journalist, Barbara Hagerty, this book lets you down on all fronts. Firstly, the book's title is a HUGE disservice to the core topic she was writing about. The book should have been titled 'Religion and the Brain - the Search for Physical Influences on Perceptions of When I first heard of Fingerprints of God I was filled with anticipation that this might be the book I've been looking for on the search for physical evidence of spirituality in the world. But, wow, was I disappointed!! Written by a journalist, Barbara Hagerty, this book lets you down on all fronts. Firstly, the book's title is a HUGE disservice to the core topic she was writing about. The book should have been titled 'Religion and the Brain - the Search for Physical Influences on Perceptions of Spirituality'. This book has nothing to do with the Fingerprints of God or the Science of Spirituality. I was actually angry she gave this book that title because it misleads the reader and feels like a marketing ploy. Next, her writing style is horrible - she spends a significant amount of words describing the look of the scientist - his or her hair, clothing, demeanor, voice inflection - do I really care????? NO. Sorry, but that's the core of the book. Hardly fingerprints. Throughout she continually asks 'what if', 'what if' it really is spiritual and not just the brain? - well, what if you didn't read this? No loss. I don't want to take away from the hard work that she put into researching this topic - I'm sure it was years of effort. But, sadly, from a reader's perspective, I felt hoodwinked. Hagerty states at the beginning of her book that science cannot prove or disprove the existence of God. I agree with this. She then goes on to try to prove God through science. She misses the fundamental principle that how much we "know" about and understand God is not a function of our knowledge or intelligence, but how closely our life is in conformance with what we know of God's will and how much we're willing to let that knowledge change us. I enjoyed learning about the Christian Science relig Hagerty states at the beginning of her book that science cannot prove or disprove the existence of God. I agree with this. She then goes on to try to prove God through science. I enjoyed learning about the Christian Science religion about one person's perspective on what this world means. I disagree with one of the main assumptions that all "spiritual experiences", from meditation to prayer to drugs-induced, are equal. And I certainly don't agree that all religions are simply different roads to the same God. I believe there is good in all religions and that all good comes from God. But that's not the same thing. How does the brain function when a Buddhist monk is in deep meditation or a charismatic Christian speaks in tongues? What do scientists know about out of body experiences? Can the mind function apart from the brain? These are some of the interesting questions that Hagerty tackles. However, she does so in a way that gives both highly educated mystics and skeptics a fair treatment in voicing their interpretations of such paranormal events. Hagerty also speaks of a new generation of scientists who a How does the brain function when a Buddhist monk is in deep meditation or a charismatic Christian speaks in tongues? What do scientists know about out of body experiences? Can the mind function apart from the brain? These are some of the interesting questions that Hagerty tackles. However, she does so in a way that gives both highly educated mystics and skeptics a fair treatment in voicing their interpretations of such paranormal events. Hagerty also speaks of a new generation of scientists who are undertaking experiments and research to find if there is any evidence that points beyond a strict materialism. Of course we have all heard stories that our attitudes affect our body, but it is deeply moving to read about these specific scientific documented affects of spirituality on our brains and our bodies. And there are many more in this book. It certainly encourages me to try to build a better spiritual practice into my everyday life. One final word about this book. The last chapter is entitled “Paradigm Shifts,” and Hagerty quotes extensively from Kuhn’s The Structure of Scientific Revolutions, which I just read over Thanksgiving for, yes, my Financial Accounting Seminar. Hagerty’s point is that we are in the midst of a scientific paradigm shift in the arena of materialistic science versus the concept of a spirit, a mind outside the restrictions of flesh. It amazes me to have my personal reading and accounting studies come together in such a direct way and makes me appreciate my doctoral studies in a whole new light. Hagerty sets out to explore the link between science and faith through a series of interviews and self reflection. What she finds is that ultimately you can read the data to support either a theistic or atheistic worldview and that a theistic reading of the data points to a god spoken of by apologists and loved by no one. What I liked about the book is that Hagerty presents a bunch of scientific (and pseudo-scientific) studies through the eyes of her own personal quest for the truth about god. S Hagerty sets out to explore the link between science and faith through a series of interviews and self reflection. What she finds is that ultimately you can read the data to support either a theistic or atheistic worldview and that a theistic reading of the data points to a god spoken of by apologists and loved by no one. What I liked about the book is that Hagerty presents a bunch of scientific (and pseudo-scientific) studies through the eyes of her own personal quest for the truth about god. She mentions the semi recent wave of atheistic writings but maintains her focus on recent avenues of scientific study into religious experience. She deals with topics fairly. She is honest about her incredulity toward certain avenues of approach to studying religious experience and when others beliefs don't line up with her own. Her conclusion is sound. You choose to view the world through the lens of belief in God or belief in nothing. But not long after a keen observation, Hagerty Drops the ball. Tied in with Hagerty's conclusion is a misplaced belief that science will eventually point toward a god. Hagerty briefly outlines this god she has found and it reads like the "unmoved mover" from St. Aquinas. Not a personal god at all, but the culmination of the divine attributes that is no more endearing than the pythagorean theorem. The spiritual experience becomes independent of any particular faith. God is stripped of God's story and is reduced to purely individual experience devoid of context. Hagerty's faith starts to sound eerily familiar. God becomes the creator/law giver and Jesus the moral exemplar. Hagerty undoes a hundred years of theological critique to the Enlightenment Project and falls right in line with Liberal Christianity. She makes these claims based on the evidence given to her during her search and then seeks to recapture her personal belief in Christianity before it slips through her fingers. She is right, nothing she found in her search pointed to a specific faith, so she simply believes in Jesus. My question for her is "Why would a God without a story, be 'the God who loves math [and:] also loves stories?'" If god's only interaction with humanity is to make us feel better while we die, who cares about tradition? Whatever clout Hagerty lost with me in her final pages, it isn't enough to detract from the fact that this is a well written and worth while book. The incredulous will hate it, the credulous will eat it up. What is of value is her honest grappling with her faith, her openness to new data and her conclusion that we choose to believe or not. and it is one of the best books I've ever read on the subject. though a series of interviews. and her conclusisons much more open-minded. nor does she set out to prove any particular theological point of view. and the exclusivity of any one tradition. and those who have had near-death experiences. effect various parts of the brain in similar ways. to the physical gray matter in our heads. to have receptors for that purpose? which is much less reductionist in its point of view. and certainly not religious fundamentalists of any stripe. One of the few books I give Five Stars! The questions that this book poses are not so much along the line of, Is there a God?, but exploring whether Science can attest that spiritual experience and experiences are something separate than just brain synapses and physiological changes. I found this book to be quite fascinating, and one that confirmed my own gut feeling (so to speak) that there is Someone Out There Watching Over Us. The author grew up in a very strong Christian Science tradition and grew up to become a journalist covering The questions that this book poses are not so much along the line of, Is there a God?, but exploring whether Science can attest that spiritual experience and experiences are something separate than just brain synapses and physiological changes. I found this book to be quite fascinating, and one that confirmed my own gut feeling (so to speak) that there is Someone Out There Watching Over Us. The author grew up in a very strong Christian Science tradition and grew up to become a journalist covering religion issues. In this book she probes the research of scientists to see what science has to say about intercessory prayer, about near-death experiences, and about all things spiritual. Along the way she finds plenty of scientists who tell her that anything that cannot be measured or quantified is fantasy, and that all so-called spiritual experiences are only things happening in the brain that can be explained in a purely material manner. She finds that long-time meditation, such as that practiced by Carmelite nuns and Buddhist monks, causes changes in the brain, so that the brains of the nuns and monks are soft-wired to be more receptive to meditative experience, and that these same changes in the brain are seen in the brains of those who have had near-death experiences and “seen the light”. She finds scientists willing to study intercessory prayer, which seems to have some measurable effect, but notes that it is difficult to account for all variables. She finds scientists who are mystics and scientists who are atheists, and learns about studies of linked people who can minutely affect each other’s physiology at a distance. The author also finds that among those who have “seen the light” may still be Christian or Buddhist or whatever, but that they are less apt to try to fit what they have experienced into a Jesus or Buddha or Jobu category, and more likely to accept what they have seen as all-encompassing love beyond sectarian definitions. A very good "intro" book to the junction of faith and science. I particularly enjoyed the studies on the meditative and psychedelic-tripped brain... which did make me want to try LSD at some later date in life. Also really loved the study on "paired" couples and their ability to effect the other over distance and with no known material connection. The chapters on near-death experiences I found tedious. While I understand that they are life-changing for many people who have them, I really fail to A very good "intro" book to the junction of faith and science. I particularly enjoyed the studies on the meditative and psychedelic-tripped brain... which did make me want to try LSD at some later date in life. Also really loved the study on "paired" couples and their ability to effect the other over distance and with no known material connection. The chapters on near-death experiences I found tedious. While I understand that they are life-changing for many people who have them, I really fail to see them as scientifically meaningful, or as proof of anything. So what if a person's heart stops and then starts? Complete brain death takes time-- a longer time than near-death experiences allow for. Near-deathers were not 'really' dead, because they came back to life. My argument is: even if these experiences DID somehow 'prove' that the individual soul continues past death, it would prove ONLY that it continues for a few minutes afterward, wherein you see light and God and loved ones and whatever religious personage you subscribe to. (This last I find a tad suspicious.) ALSO, why do the people who study these things ignore the fact that MANY, perhaps even the majority, of people DO NOT HAVE THEM when they 'die.' They just die, and are unaware of anything. This book can't answer the Big Question: is God really communicating with people who have spiritual experiences during prayer, in spontaneous healing, or in near-death experiences? What it can do is describe some new science that studies the brains of people who have had life-changing spiritual events. Brain activity, brain chemistry, and in some cases genetics are different for people who have had what they consider encounters with the spiritual than they are from people who haven't. What's mor This book can't answer the Big Question: is God really communicating with people who have spiritual experiences during prayer, in spontaneous healing, or in near-death experiences? What it can do is describe some new science that studies the brains of people who have had life-changing spiritual events. Brain activity, brain chemistry, and in some cases genetics are different for people who have had what they consider encounters with the spiritual than they are from people who haven't. What's more, there is some actual scientific evidence that near-death experiences might be real and that prayer might have measurable effects (and not those debunked hospital studies, either). I added this book to my wishlist after hearing the story about the book on NPR. Almost two years later, I finally read it. It's very interesting. You get to read about all sorts of spiritual experiences people had, like encounters with God, near death experiences, spiritual conversions... and then an explanation of what's going on from the neurological perspective. There were quite a few interesting stories. The writer shares her own spiritual experience, which wasn't quite as interesting, but r I added this book to my wishlist after hearing the story about the book on NPR. Almost two years later, I finally read it. It's very interesting. You get to read about all sorts of spiritual experiences people had, like encounters with God, near death experiences, spiritual conversions... and then an explanation of what's going on from the neurological perspective. There were quite a few interesting stories. The writer shares her own spiritual experience, which wasn't quite as interesting, but relevant. The book comes down to the idea that there's a part of the brain that seems to be involved in pretty much everyone's spiritual experiences, which Hagerty likens to piece audio hardware, and poses the question is it more like a radio, receiving real signals from a real God (some people's radios work better than others) or is it more like a CD player, where everything is just in our heads? 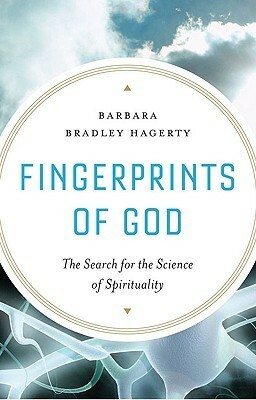 Fingerprints of God: The Search for the Science of Spirituality, by Barbara Bradley Hagerty. Lifelong Christian Science devotee Barbara Bradley Hagerty, inspired by a spiritual encounter she could not explain, spent years exploring the nature of God. 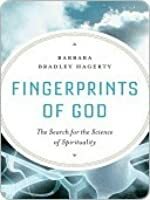 Fingerprints documents her journey through the labyrinth of stories from people who’ve experienced a transcendent connection with something Other that changed them forever, and Hag Fingerprints of God: The Search for the Science of Spirituality, by Barbara Bradley Hagerty. I had a very hard time reading through this book. Not because it wasn't well written, at least I don't think, but because I kept thinking, what's the point for me in this? I honestly skipped several chapters and read the last one and then thought... "EXACTLY! Exactly how I feel." Not sure I'd recommend this to anyone but for the right person on a journey of faith with a lot of questioning going on at the time - it could be useful. I was disappointed. I was expecting a scientific approach to the subject of Spirituality -as the title suggests it, but I did not find any scientific material. Perhaps it is is a good book for someone starting a quest into Spirituality but, for me, it was too basic. Much of the first half felt like Hagerty had trouble figuring out what she wanted to say. The last 100 pages had some decent content that felt a little more concrete. It's an okay introduction to neurotheological issues, but if you've already explored some of that, this won't add anything, really. Another book in my study of the neuroscience of prayer. There was only one chapter really applicable to that, but I admired the author for the extensive look she did into the science of spirituality, although some of her conclusions were different from mine. Fascinating review of science of spirituality. Very thought provoking! “The real distinction between a material and spiritual worldview, [William] James wrote does not rest in "hair splitting abstraction about matter's inner essence, or about the metaphysical attributes of God. Materialism means simply the denial that the moral order is eternal, and the cutting off of ultimate hope; spiritualism means the affirmation of an eternal order, and the letting loose of hope".